Currently available at Tayside Memories: The Story of a Lanark County Lad Living at a distance has its challenges for this project. The book is currently only available online. Last week I fulfilled a ‘bucket list’ wish. I was able to assemble and send for publication my father’s memories of his life at Tayside Farm, my childhood home. I began this task many years ago, attempting to do so in a word processing software and finally gave up. This fall I signed up for an Alberta Family Histories Society workshop and finally found a tool and the encouragement to attempt this project again. Michele Buhler helps people write their life stories – and yes I am working on mine in her writing course! Who was Ernest “Ernie” Miller? Ernie Miller was born and lived on Tayside Farm 1917-1997. His heritage was Irish and Scottish and his various ancestral lines lived in Lanark County, Ontario for several generations. He was a breeder of purebred Holstein cattle and his breeding stock was known around the world in the 1980s. During his youth he excelled in judging competitions, love the livestock show ring as an exhibitor and took every chance to further his agricultural education through winter courses and reading. His involvement in Ministry of Agriculture calf clubs led to an interest in the Junior Farmer movement. Just prior to his marriage, he participated in the founding of the Ontario Junior Farmers Association. Throughout his years of farming he was active in a variety of agricultural and community organizations, often in a leadership role. Eventually, as his son John became active in the farm operation, he served as a Director of the United Co-operatives of Ontario (UCO). In retirement he became active once again in local organizations. He became deeply involved in projects of the Perth-on-Tay Kiwanis organization and helped to launch the Lanark County Chapter of the Alzheimer’s Society. Ernie also became well known and respected for his indexing and organizing of genealogical records pertaining to the families of Lanark County and I frequently stumble on his work while working with the Ancestry website. The Lanark County Genealogical Society and Kingston Branch of the Ontario Genealogical Society published much of his work. In 2002, J.R. Ernest Miller was inducted into the Ontario Agricultural Hall of Fame in Milton, Ontario. Why did I feel it was important to publish this personal story? 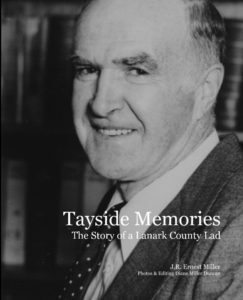 The book, Tayside Memories: The Story of a Lanark County Lad, is about much more than one man’s story. In his childhood memories and the family pictures included, we find clues to the history of the village of Glen Tay, once a thriving mill community. In his description of farming practices we are reminded of the reality of farming in eastern Ontario prior to and during the second World War and the rapid changes that unfolded post war. Ernie talks about the social life of the time, the church he was deeply committed to, the neighbours and other farms of the area. Tayside Farm stretched along the banks of the Tay River which figures prominently in his story. A second farm, located near Dewitt’s Corners was also on the banks of the Tay. His family had a multi-generational involvement in the co-operative movement, a factor that led to his service on the UCO Board. Some of that involvement is included in his memoirs. I am already receiving notes from people who knew of his involvement in other aspects of the community – groups and activities that I did not know about or that had faded from my memory. It is hoped that you will read this story with as much enjoyment as I experienced during the editing and assembly process. At the moment it is only available at blurb.ca website (link provided above). I no longer live in the community and distribution otherwise would be a challenge. Well done, Diane! Your book is indeed a treasure for everyone. It is not easy to get pictures, ideas and writing all organised in an attractive readable format.